"Life is electrical. A new medicine and a new Earth will arise from this premise!" WE have all been alive since the first spark in the beginning, carrying the flame of life through the epochs and are of the primordial mother cell, all of us. The oneness of all living is exceeded only by the fact we are all (one) matter, born of the original energy that blasted the worlds into existence. You are me, the rock, the ocean and the galaxy. I'd say EVERYTHING is pretty closely related. The molecules that surround us are the same ones that construct our bodies and perpetuate life out of air, water and soil. These molecules may be packed with electrons or hungry for some, and this determines their behavior and associations (redox). Electrons themselves capture the power of photons and radiant heat from the Sun as the common currency of energy. Have-not molecules seek out those that have, and take them or share, and in sharing become larger. Large enough to build cells, large enough to build DNA and carry information and large enough to generate magnetic fields and... consciousness. It stands to reason that if molecules build cells and our bodies, that they must be of the correct elemental type and charge...and be capable of performing the business of cells, the biochemistry of life. Just as Dr Frankenstein infused his monster with gobs of electricity, we must quantitatively supply electrons to the body we live in and its cells must generate more. When through inappropriate nutrition or charge-robbing toxins and toxic thoughts our actual measurable voltage drops, our molecules begin to act erratically, cells refuse oxygen, immune systems grow weak and DNA malfunctions. Unchecked, this condition spirals down into disease, YES, MOST ALL DISEASE. When a healer's efforts are organized to reverse these negative conditions, magically cells regain function and the monster rises robust and healthy. These efforts must be directed at the inventory of molecules AND their energetic condition, their electron balance. Once an overwhelming electron presence is restored, oxygen becomes available, mitochondria fire up their furnaces and the grid is brought to full power. A healer will not accomplish success with a single drug or supplement, he must address everything. It takes a holistic approach to reverse the CAUSE of the ultimate source of disease and bad ageing, a condition where essential molecules are attacked by electron have-nots, are oxidized and torn apart; oxidative stress. Sometimes oxidation is required to "fight fire with fire" and destroy sources of free radicals and unwanted pathogens. You can see oxidation in rusting metal, a burning match or an apple that turns brown. The medical mindset of chasing "unique" symptoms ignores the fact of this root cause which manifests in particular ways due to the nature of biochemical deficiency in areas of fluid stagnation. A close analogy to disease is the car that won't start. Jumper cables boost charge so the starter can engage. Then Oxygen and fuel rush in (to mitochondria) to supply energy. AS soon as the engine turns over, the generator is activated, the dashboard lights up, the radio comes on and perpetual electron flow restores battery (fluid/electrolyte/cell membrane) charge. The causes of oxidation/reduction imbalances are mostly modern side effects of the industrial revolution which have undeniably altered our chemistry. Nutrition has changed from the paleo diet our bodies were adapted to over the eons. Instead of fish/animal fats and proteins, and wild plant foods "science" rearranged the food chain and based it on easily mass produced grains like wheat, corn and rice, and soybeans, and all their processed derivatives as well as grain feed-lotted meats/milks/eggs. Put simply, we shifted to electron-poor diets, high in carbs/sugars and bereft of minerals, antioxidants, healthy fats and diverse proteins. Thinking on cancer (and most other disease) is beginning to recognize this view. Somewhere in the distant past our primordial cell line existed in anaerobic environments. When our typically oxygen-rich conditions of today are preempted by poor charge and growing acidity, cells revert to anaerobic fermentation to produce only small amounts of energy and are called cancer or other disease by degree. Folks are terrorized over this apex disease, become emotionally crippled and lose all coping ability. Having reversed cancer and many other diseases, I recognized the successful therapies of many alternative physicians and realized the common working thread; cell energy-draining acidic hypoxia. Once inner conditions decline, they favor primitive anaerobic life forms lying dormant in our DNA. Not only do our evolved oxygen loving cells decline, but oxygen-resistant survivors of the past like bacteria/molds/yeasts/fungi ...reappear. The Grail of healing lies ultimately in restoring (electron) energy and total body charge in order to move more O2 into cells and mitochondria (a primitive cellular organelle responsible for energy production found in all living cells) and so power us. The healing protocol includes a combination of efforts to raise antioxidant intake AND stimulate (counter-intuitively) immune oxidative bursts. Alkalization of the system is aided by a boost in oxygen protective K, Mg, bicarbonate electrolytes. Detoxification involves raising charge to mobilize metals and organo-toxins. Replacing damaged/oxidized fat molecules incorporated in cell membranes removes a major bottleneck to oxygen penetration. No drug or single supplement can restore vibrant physiology and initiate self-healing. It takes a protocol equivalent to the bad foods, environmental toxins and negative emotions that initially eroded health. When the condition of our "inner ocean" becomes accepted as the cause of disease, we can begin treating our cells more like fish in an aquarium. Just "change the water" and provide fresh live food. The entire area of health and healing has become overcomplicated and financially conflicted so that information is not only confusing and subject to fraudulent science, but officially controlled. Real solutions are forbidden. Compartmentalization of scientific disciplines persists where chemistry, biology and physics must cross-pollinate and become integrated. A mass awakening is urgently needed to replace our environmentally unsustainable and artificial chemical grain-based agriculture and toxic industrial practices that seem to require an extravagantly expensive and ineffective pharma-care system. Higher consciousness and levels of intelligence depend on a strong body voltage. 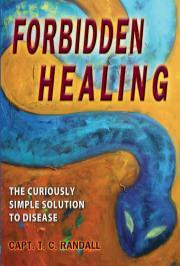 Restoration of health precedes improved mind function... so desperately needed by civilization. Biospheric suicide is the result of man's mal-applied industrial technology that has resulted in acidic hypoxic oxidative stress, globally. Now Available at the GreenMedInfo Book Store, for download.